…Traveling with The Beatles in 1964 and 1965! Author of the award-winning book “The Beatles and Me on Tour,” Ivor was an eyewitness to rock and roll history. Now he reveals inside stories you have never heard before about life with John, Paul, George and Ringo and their adventures with Elvis and Bob Dylan. Beatles expert, syndicated radio personality of Come Together with the Beatles and author of the book, “Do You Really Know the Beatles?” teams up for this unique event, singing and playing Beatles songs and John’s Working Class Hero. –Brooke plays and sings their world-class hits! –Ask Ivor and Brooke your John and Beatles questions during the Q&A! PLUS: Ticket admission includes a special screening of the classic movie Sgt. Peppers Lonely Hearts Club Band following the live performance. Be part of John’s birthday celebration and find out what John, Paul, George and Ringo were really like off stage and in private. 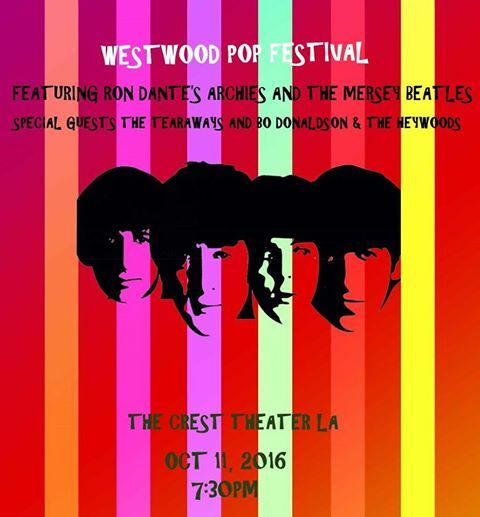 Ron Dante’s Archies and The Mersey Beatles w/ Special Musical Guests The Tearaways. Ron Dante is best known as the lead singer for the fictional cartoon band The Archies, with the hit song “Sugar, Sugar”. Ron is also know for the group The Cuff Links, and is well known as the co-producer of Barry Manilow’s first nine albums. Dante’s first album release under his own name, which he recorded on Don Kirshner’s label, was Ron Dante Brings You Up in 1970. In 1972, also under the supervision of Kirshner, Dante became lead vocalist for another cartoon group, The Chan Clan. In 1979, he recorded a disco album under the name Dante’s Inferno for the short lived Infinity Records label, and in 1981 his second solo album Street Angel was released. From 1973 to 1981, Dante was the record producer for singer Barry Manilow, and often sang backup on Manilow’s recordings, including the 1974 #1 single “Mandy.” In 1978, Dante produced the Tony Award-winning musical revue Ain’t Misbehavin’ on Broadway. Today Dante remains active as a singer, producer, and concert performer. An album, Favorites, was released in 1999, and another CD, Saturday Night Blast, was issued in 2004. The extended play California Weekend CD was released in 2006. Dante’s most recent high-profile appearance was with the CBS Orchestra on the Late Show with David Letterman on July 28, 2010.